"We were born to survive outback life/ generations of toil and strife/ we don't know any other way/ when the sun beats down so damn hard/ and it's 40 degrees in the holding yards." - Born To Survive - Troy Cassar-Daley. It was as much about resurrection as survival when thousands of music lovers returned to Whittlesea show-grounds to celebrate the 10th annual country festival. Some of the Sabbath survivors still live in nearby tent, caravan and cabin cities as they wait to rebuild or head for greener pastures. But here, under a cloudy blue sky, instead of a horrific acrid orange haze that claimed 173 lives, countless livestock, wildlife, family farms, homes and vehicles on February 7, 2009, there was a feeling of camaraderie and goodwill. The rural rooted Pied Pipers, armed with banjos, mandolins, fiddles and other stringed instruments, led their followers back to a better place. This recovery from the 2009 Black Saturday bushfires began at a benefit festival at the same venue in April last year. That autumnal rebirth was a slice of solace for music lovers from afar and local residents seeking a shoulder to drench heat scorched nightmares. Artists diverse as Catherine Britt, Adam Brand, Mike Brady, Paul Costa, Travis Sinclair, Leslie Avril, Bobby Valentine and bands including The Distance, Ruckus, Prairie Oysters and Black Hill Ramblers donated their time and talent. They followed the advance party of Brand, Troy Cassar-Daley, Shannon Noll and Lee Kernaghan who touched down in the hills and valleys in the days immediately following the bushfires. They were not just playing and singing but unloading and distributing donated goods behind the scenes. But that was then and this is now - the second weekend in February with three-day festival and Victorian Country Music awards that began on the Friday night. Carter & Carter, whose Kinglake home was spared last year, won best group trophy at the for their evocative tune Surviving Black Saturday. There was enough talent spread over the weekend to justify the advance publicity that spread way beyond community radio, TV and burning bush telegraph. 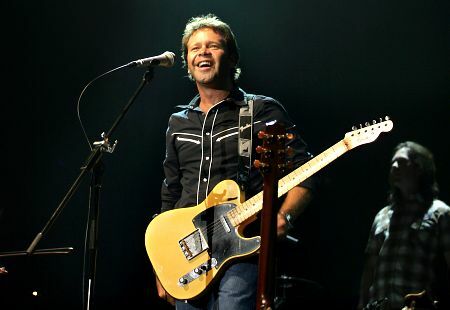 With six new Golden Guitars bringing his tally to 20 and a second ARIA Award, Troy Cassar-Daley was infiltrating the mass print media and TV but, not of course, the corporate, commercial radio chains and myopic me -too mausoleums where eclectic play lists are citified Kryptonite. Hey, why do you reckon the new Jeff Bridges movie Crazy Heart was sponsored by a talk station - 3AW? Don't frighten the horses, boys and girls, we've got the demographically challenged advertisers to harness and milk. Sadly, as a time challenged volunteer, I can't claim to critique the entire festival. I'll leave that to the folks who camped under stars or ploughed their daily bread into the voracious and deserving local hospitality community. Last time I was in Whittlesea was as volunteer sales supervisor for the St Vincent de Paul bushfire relief CD After The Fire in April. That's where I met many survivors who soaked up the music of the artists who donated their considerable talent and time. This time I had a rare paying gig for celebrated national music magazine Country Update in the rural radio oasis of Queensland. It was probably poetic my journey - not from the Shipwreck Coast but the Mornington Peninsula retreat of Rosebud - was rewarded with a nice slice of irony. The first act I caught was refreshingly liquid, Biblical Sydney band The Flood. Now, if only their name had been acted out in an unseasonal drenching on February 7 last year, we would not be recovering from bushfires. Mind you if arsonists were shot at birth, power lines were underground or repaired frequently, forest floors grazed by cattle and sheep and gardens and road sides cleared of debris we might also be in a better place. The Flood, former touring partner of Kevin Welch and Kieran Kane, and regular guest on diverse festivals, is a professional act not needing much introduction. Lead singer Kevin Bennett, who has a tandem solo career, has a nice line in self-deprecatory humour. The band kicked off with Bennett's social comment tune 2003 before it revived 2006 Golden Guitar winning song Hello Blue Sky from its third album The Late, Late Show. The singer paid tribute to the Sabbath with thanks for a cup of tea with honey for his voice and borrowed acoustic guitar and then return of his own with repaired string that broke mid-song. Bennett also introduced banjo ace Mark Collins, doubling on percussion, after Dylan classic When I Paint My Masterpiece as segue into Sitting On Top Of The World. The Flood picked up local multi-instrumentalist Gary Caruthers who was to return later in the day with Cassar-Daley. It was no surprise the band performed its popular tune Tear Stained Lie - somewhat cryptic was Bennett's introduction to Hillbilly Heroin for his "little brother." It was equally salient that song preceded their version of classic Silver Threads And Golden Needles. Yes, definitely needles of a more innocuous kind. The break between The Flood and Newcastle born singer-songwriter Catherine Britt enabled embattled Premier John Brumby to announce winners of Ute and truck contests, various raffles and other matters of state. A spate of booing receded when Danielle Green - volunteer fire fighter, mother of two and ALP member for Yan Yean since 2002 - joined her boss on stage. Green, who hails from Warrnambool on the Shipwreck Coast, didn't reprise her singalong with Brumby and others at 2009 Wandong Country Music Festival. "We sang the old Slim Dusty song Love To Have A Beer at Wandong last year but you'll be pleased to know we're not going to sing today," the Premier told music lovers of the Pat Alexander song decomposed by this writer as I'd Love To Have A Joint With Willie when recorded by the Dead Livers. The writer may have spent nine years in the same font of learning as the Premier but escaped the bluestone Borstal in South Yarra, known to some as Melbourne Grammar, a decade earlier - the sixties - to pursue a vastly different career path. The other weekend warrior pacified the crowd with tales about envy for winners - especially the FJ Holden owner - and self-deprecatory anecdote about his aged Nissan Ute on his farm near Bendigo. Luckily there was no mention of the 1947 Chevy Ute I learned to drive on the banks of the Hopkins River in the late fifties. But the Premier, mindful the large number of bikies in the throng might cast votes in late springtime, had a yarn about a fellow Cabinet Minister. "The Minister for Transport Tim Pallas came here today on the back of a bike from Albert Park," the Premier confided, "his legs are still numb. He had an hour and a half on the back of a bike." Not quite as long a wait as suburban commuters and country folks singing the Jimmie Rodgers blues while waiting for a train on a hot day. Bemused spectators thought Pallas was Minister For Roads And Ports and Martin Pakula stepped into Lynn Kosky's caboose as Minister For Transport. Brumby also praised the audience - especially volunteers - for rebuilding work after the fires. "The community spirit that came through here and across the state was absolutely first rate," Brumby said. It was a short cameo, albeit longer than his minders had planned, and left fans in radio limbo - eager to hear music instead of talkback. Unlike on the corporate commercial chains they were granted their wish. Newcastle born singer Catherine Britt boomeranged to the same stage she graced at the April benefit after a five-year battle in Nashville. Bur this time Catherine brought her family - sire Steve (reprised recently on Rockwiz,) mother Sue and kinfolk whose tonsorial tableau proved she was a natural blonde. Britt chose fitting entrée Swinging Doors that segued into her embryonic hit Hillbilly Picking Rambling Girl from Bill Chambers produced debut disc Dusty Smiles & Heartbreak Cures. 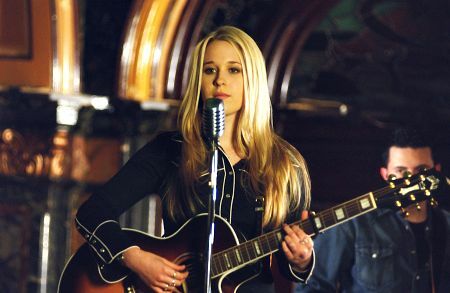 She then revealed a yearning for her absent parents during her Nashville sojourn as source for Too Far Gone that preceded the title track of third album Little Wildflowers. "I wrote this song when I moved away from home for the first time," the singer told her audience including her extended family. It was unlikely there was parental supervision during the nocturnal events that fuelled the song of regret What I Did Last Night. "It's about having a very big night out and how you feel the next day," she confided. The singer also previewed her fourth album, due in May, with possible single Can't Change A Thing. "I'm very nervous, we've only played it once before," Britt added. "We're using you guys as guinea pigs a bit." But the real guinea pigs were Britt's nephews Hayden, 4, and Dylan, 2, who joined her onstage for her Hank Williams inspired Hot Dogging. "My nephews live in Melbourne now and this is their very first time on stage," the singer said before performing her song that featured recently deceased Drifting Cowboys pedal steel guitarist Don Helms on her album. It was light relief before another new song I Want You Back - written with Bill Chambers who produced her new album with his son-in-law Shane Nicholson. Britt returned to more familiar fare with I'm Not Your Cinderella, Fred Eaglesmith's I Like Trains and debut single That Don't Bother Me. The fitting finale was piano driven Nashville Blues - salient comment on her Music City era. Britt proved once again she has sufficient twang in her voice and soul in her songs to be a true talent. Now, if only radio could join the party. When Britt passed the performing baton to Grafton trio The McClymonts it was a subtle, symbolic transition. The sisters stepped into the Newcastle novitiate's shoes with their major Nashville deal - Universal instead of BMG-RCA. So it's no surprise their second album is aimed squarely at U.S. radio without a bucolic bypass for moribund local lepers. This ignited a flood of vitriol from local rock reviewers with disdain for country artists spreading wings beyond the vocally challenged pop genre. Now, this foray into music meccas beyond our shores has been buoyed by a print media and TV invasion befitting pop acts swinging from corporate chains. That has been accompanied by fully choreographed stage shows - visual experiences designed to reach way beyond the genre and nation. It all started on their national tour with Lee Kernaghan that morphed into a faux Dixie Chicks comparison. But there are major sonic differences. There are three sisters, not two, and they play guitar, bass and mandolin with blokes providing the fiddle and drums. The first version of Dixie Chicks arose from bluegrass busking and Dale Evans era cowgirl songs before the sisters Erwin added Natalie Maines. But that comparison doesn't hurt The McClymonts whose stage presence is striking from their entrance. Their repartee is fresh and natural and their music energised as a conduit to audiences way beyond their demographic. They excel on vibrant songs such as Ghost Town and Shotgun and can get away with singing about stalking. "We're going to do a new song - and it's all about stalking and I don't know if you have done that before," elder sister Brooke, 28, reveals. About six songs into their set I was called away to do an interview but I returned in time to learn the fiddler's name was Luke and hear audience members invited to take their clothes off. Unlike at the Sunbury festival a few moons ago, so to speak, I didn't take up that kind offer. But as I'm climbing under the fence to leave the oval I'm tapped on the shoulder by a former undercover Drug Squad detective who was on duty in ponytail and sandals at Sunbury. Today Chief Inspector Don Boyd is stationed at Rosanna and pro-active part of the ongoing bushfire recovery task force. Meanwhile back to the trio who performed the title track of second album Wrapped Up Good. And, of course, many other new tunes including Kick It Up, I Could Be A Cowboy, Heart's On Fire and Cannonball as My Time and others from debut album Chaos & Bright Lights. The sisters impacted with the crowd throughout a set that didn't lose pace on a bill that reached back to gospel at 8 am. The only cover appeared to be the Cat Stewart staple The First Cut Is The Deepest. The McClymonts may have decamped the stage at dusk but they were not gone for long. A welcome addition to the bill is one time Nu Country FM member and singing actor James Reyne. Reyne duetted with fellow Mornington Peninsula band The Distance on one of their CDS and video clips and is proud to showcase country roots. His vast experience enabled him to immediately connect with the crowd as he picked up the tempo with long time guitarist Brett Kingman. Reyne played original songs Little Criminals and One More River and other selections from his eight solo albums. He also revamped Australian Crawl classics Reckless and Downhearted and honoured legendary Tasmanian actor Errol Flynn with his Crawl hit Errol. 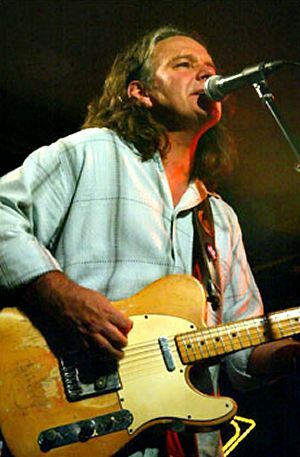 Guitarist Kingman's sister Tracey played a more hirsute James Blundell in their duet of The Dingoes hit Way Out West as the finale. All we needed was Broderick Smith to give a Sunbury flavour. Dusk was settling on the oval, blessed with an unseasonal green tinge, when headliner Troy Cassar-Daley returned to the scene of the rhyme. It was a true case of déjà vu. Troy was one of the first to fly in from interstate and donate his talent to victims and survivors immediately after the fires. "It was the least I could do," Cassar-Daley 41 and father of two, told fans on his return for the festival. "I gate-crashed the festival this year as I desperately wanted to be part of the healing." The Grafton born singer-songwriter had plenty of other reasons to want to share - six new Golden Guitars and a second ARIA award for his seventh album I Love This Place. He also won two more Country Music award on the Friday night of the festival - one with The McClymonts. The singer hit the stage with 2010 Starmaker winner Luke Austen on lead guitar and multi-instrumentalist Gary Carruthers in his beefed up band. It was a major triumph from entrée Sing About This Country and heroes homage They Don't Make Them Like That Anymore. Then it was a trip through his extensive song catalogue with Grafton ode River Town, Moe Bandy influenced Bar Room Roses and Lonesome But Free about a hometown uncle. Although the singer repeatedly declared I Love This Place was about a moment in time it was fitting, he said, to make it a eulogy to Whittlesea. "This is the 10th year this beautiful festival has been run," Troy added. "I was a last minute ring-in, I wasn't on the bill. I rang and forced my way onto the bill. I'd like to dedicate this song to Whittlesea. I'm so proud it won a Golden Guitar." The singer dedicated Chasing Rodeo to embryonic mentor Brian Young who took the singer to the outback as a teenager. He also performed Born To Survive for local residents who boomeranged from the bushfire and two young buskers set to join him on Nine Network travel show Postcards. It seemed like a parade of rural anthems with River Boy preceding I Wish I Was A Train. "When I first wrote this song with Paul Kelly I was really intimidated," he said of the latter song. "He is one of my big heroes. Sitting across the table from him was one of the most daunting things I ever did. It's still one of my favourites." So was the late Slim Dusty whose widow Joy McKean wrote The Biggest Disappointment - prelude to early hit Dream Out Loud featuring singer on didgeridoo. By the time he finished Big, Big Love it was clear there was movement at the station - well at least backstage. "We usually do this song in sound check," the singer confessed, "but it's a special occasion today. I wish everyone the best in Australia, especially up here because we love you and that's why we're here." So it was a festival choir who joined the singer and band for gospel finale Everything's Going To Be Alright. Not many brunettes - just one (Brooke McClymont) next to sisters Mollie and Samantha, Catherine Britt and Felicity and a bloke Darren Colston. It was a triumphant resurrection - the healing had begun with a flourish. But beneath the falling shadows the harsh reality of a triple family death a year ago loomed for Country Paydirt singer Ross Buchanan. Although many artists had the benefit of geographical isolation, that was not the case for the Kinglake singer and wife Bec who lost a son Macca, 15, and daughter Neeve, 9, in the fires. They were also mourning the death of Bec's brother Danny who tried to save his niece and nephew. Buchanan and Country Paydirt found solace when they played the April festival and returned this year for Saturday concerts. They recorded their song Salty Tears at aptly named Salt Studio in East Brighton for St Vincent de Paul bushfire relief CD After The Fire. International touting country trio Kane-Welch-Kaplan recorded Welch's evocative new song Marysville and former Goanna singer Shane Howard wrote Carry Me about Black Saturday for the Vinnies CD. The Buchanans, key figures in an acclaimed ABC documentary and new book on the fires, dealt with their tragedy by keeping busy. They took pro-active roles in promoting the Vinnies CD and Buchanan's other recording projects during their grieving. And Bec revisited her voluntary work as a major festival organiser 12 months later. Although Ross played at the festival there was a vast void on the Sunday when peers hit the stage. Buchanan, whose surviving son Aiden, 13, has been mentored by former Test cricketer Shane Warne, steered clear of the media. He surrounded himself in the shade with friends and Victorian politician Danielle Green - volunteer fire fighter, mother of two and ALP member for Yan Yean since 2002. It was his day in the shade until Troy embraced him backstage and pulled him close for a photo for posterity - whatever that means in a sea of tear stained letters.